VANCOUVER, June 27, 2018 /CNW/ - Mawson Resources Limited ("Mawson") or (the "Company") (TSX: MAW) (Frankfurt: MXR) (PINKSHEETS: MWSNF) announces results from ten holes drilled at the Company's 100% owned Rajapalot gold-cobalt project in Northern Finland during the winter 2018 program. Eight new holes are reported from three prospect areas while cobalt assays are provided from two holes where gold-only values were previously available. 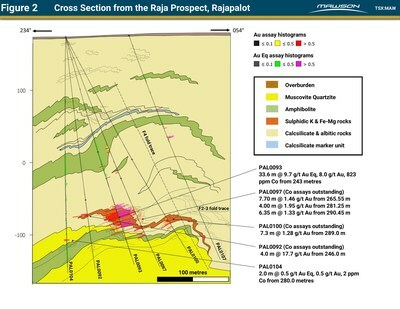 All holes except one intersected gold-cobalt mineralization, with results delivering increased confidence and extensions of the cobalt-gold mineralization at Rajapalot. Thirty-six holes from a total of 75 drilled have now been reported from the winter program. The winter diamond drill program totalled 16,204 metres in 75 drill holes across four exploration permit areas. Including those published here, assays from 36 drill holes have been released from Rajapalot and East Rompas. A further 39 drill holes are currently being logged and assayed. Ground magnetic and electromagnetic surveying is planned to commence in late June and September respectively. Mr. Hudson, Chairman and CEO, states, "Rajapalot continues to present new and exciting opportunities with every additional result. We continue to be encouraged by the broad uplift in gold-equivalent grades after the addition of cobalt assays, particularly in PAL0093 which assayed 33.6 metres @ 9.7 g/t Au Eq. 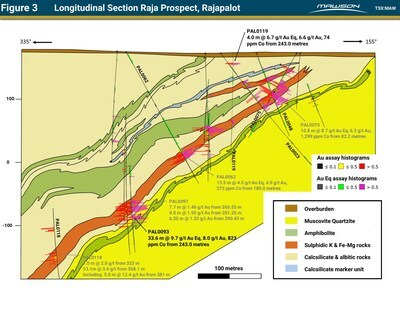 New targets continue to be generated as evidenced by the near-surface structural zone of mineralization discovered at Raja with PAL0119 intersecting 4.0 metres @ 6.7 g/t Au Eq. 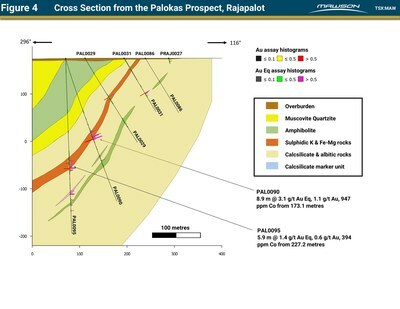 Known mineralization was extended at Palokas, 1.8 kilometres from Raja, where the mineralized position was successfully extended down-plunge by 100 metres. Furthermore, our increased geological knowledge of the mineralized system has facilitated regional targeting with 1-2 kilometre step out holes. With thousands of gold and cobalt assays still in the laboratory, we look forward to announcing data as they become available." Assays from ten holes are reported: PAL0083, 90, 93 (cobalt only), 95, 104 (cobalt only), 107, 119, 124 (gold only), 139 and 143 from the Raja, Palokas and Hirvimaa prospects. All holes, except PAL0124 (gold-only assays to date) hit anomalous gold and/or cobalt mineralization. A plan view of the drill results and named prospects is provided in Figure 1. Cross and longitudinal sectional views and prospect plan views are included in Figures 2-4. Tables 1-3 include all relevant collar and assay information. Assuming a predominant stratabound control, the true thickness of the mineralized interval is interpreted to be approximately 90% of the sampled thickness. Intersections are reported with a lower cut of 0.5 g/t gold or 0.5 g/t gold equivalent when cobalt assays were available, over 1 metre width and no upper cut-off was applied. The gold equivalent (Au Eq) value was calculated using the following formula: Au Eq g/t = Au g/t + (Co_ppm/481) with assumed prices of Co $88,185/t; and Au $1,320/oz, where 1 g/t Au is equivalent to 0.048 % Co.
With increased geological knowledge, the mineralized system has now been targeted at both Hirvimaa, 1 kilometre NE of Palokas (Figure 1) and at Raja East, 1.8 kilometres to the ENE of the Raja prospect. 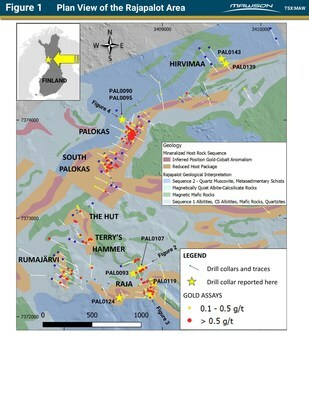 Drilling at Hirvimaa, located 1 kilometre NE of Palokas and outside the Natura 2000 area, revealed a continuation of the prospective stratigraphic mineralized sulphide position and extended the mineralized system at least one kilometre further than previously identified. Both reported drill holes intersected pyrite with low grade gold but elevated cobalt mineralization, including: PAL0143: 4.1 metres @ 386 ppm Co (0.8 g/t Au Eq) from 93.1 metres and PAL0139: 2.0 metres @ 365 ppm Co (1.4 g/t Au Eq) from 41.6 metres. In addition, 1.8 kilometres to the ENE of Raja prospect, the same interpreted altered host sequence has been discovered in the most recent drilling. A cobalt geometallurgical study has commenced to investigate the relationships of the cobalt minerals (cobaltite and cobalt pentlandite) to the gold, sulphide and silicate minerals. This is being conducted with the Geological Survey of Finland (GTK) and the Camborne School of Mines (University of Exeter). Initial interpretations of the pilot hyperspectral study of drill core from the Raja prospect shows significant variation in the compositions of hydrous minerals associated with gold and cobalt mineralization, in particular muscovite species. Research projects in cooperation with the Geological Survey of Finland (GTK) and Oulu University Graduate students will help to define the extent, nature and controls of the hydrothermal alteration responsible for the gold-cobalt mineralization at Rajapalot. Diamond drilling is planned to restart during September 2018 at Hirvimaa, Raja and Männistö exploration permit areas. Further ground magnetic work and planning of ground and downhole electromagnetic surveys to further refine winter 2019 drill targets, in particular, the down-plunge continuity of Raja prospect continues. Ground magnetic surveys will commence in late June and electromagnetic surveys in September 2018. Five diamond drill rigs from the Arctic Drilling Company OY ("ADC"), Oy Kati Ab ("Kati") and MK Core Drilling OY ("MK"), all with water recirculation and drill cuttings collection systems were used for the drill program. Core diameter is NQ2 (50.7 mm) or WL76 (57.5mm) diameter core. Core recoveries were excellent and average close to 100% in fresh rock. After photographing and logging in Mawson's Rovaniemi facilities, core intervals averaging 1 metre for mineralized samples and 2 metres for barren samples were cut in half at the Geological Survey of Finland (GTK) core facilities in Rovaniemi, Finland. The remaining half core is retained for verification and reference purposes. Three laboratories are being used to conduct gold and multi-element assay work. Samples were transported by Mawson personnel or commercial transport from site to the CRS Minlab Oy facility in Kempele, Finland, or to the ALSGlobal sample preparation facility at Sodankylä, Finland. Samples submitted to Kempele were prepared and analyzed for gold using the PAL1000 technique which involves grinding the sample in steel pots with abrasive media in the presence of cyanide, followed by measuring the gold in solution with flame AAS equipment. In order to improve the detection limit of the PAL1000 technique from 0.05 g/t Au to 0.01 g/t Au for a 1 kg sample, gold concentration using the DiBK (di-isobutyle ketone) extraction method was also used. Samples transported for gold assay to Sodankylä were analysed using 50 g fire assay and ICP finish method Au-ICP22. Multi-element analytical work was conducted by MS Analytical and ALSGlobal using methods IMS-230 and ME-MS61 respectively, both using four acid digest followed by ICP analysis. The QA/QC program of Mawson consists of the systematic insertion of certified standards of known gold content, duplicate samples by quartering the core, and blanks the within interpreted mineralized rock. In addition, all three laboratories insert blanks and standards during the analytical process. This news release contains forward-looking statements or forward-looking information within the meaning of applicable securities laws (collectively, "forward-looking statements"). All statements Mar 01, 2018in, other than statements of historical fact, are forward-looking statements. Although Mawson believes that such statements are reasonable, it can give no assurance that such expectations will prove to be correct. Forward-looking statements are typically identified by words such as: believe, expect, anticipate, intend, estimate, postulate, and similar expressions, or are those, which, by their nature, refer to future events. Mawson cautions investors that any forward-looking statements are not guarantees of future results or performance, and that actual results may differ materially from those in forward-looking statements as a result of various factors, including, but not limited to, capital and other costs varying significantly from estimates, changes in world metal markets, changes in equity markets, planned drill programs and results varying from expectations, delays in obtaining results, equipment failure, unexpected geological conditions, local community relations, dealings with non-governmental organizations, delays in operations due to permit grants, environmental and safety risks, and other risks and uncertainties disclosed under the heading "Risk Factors" in Mawson's most recent Annual Information Form filed on www.sedar.com. Any forward-looking statement speaks only as of the date on which it is made and, except as may be required by applicable securities laws, Mawson disclaims any intent or obligation to update any forward-looking statement, whether as a result of new information, future events or results or otherwise. Table 1: Better intersections from the 2018 Winter Drill Program. Intersections are reported with a lower cut of 0.5g/t gold over 2 metre lower cut. No upper cut-off was applied. Table 3: Individual assay data from reported drill holes (detection limits are reported as negative numbers).